India post recently released the notification for the recruitment of gramin dak sevak for madhya pradesh circle in appost.in / GDS online. If any person living in MP and wanted to get job in postal department then they can apply online for this GDS Vacancy. Here we have written article about the information of MP GDS Recruitment 2018. You will find the official notification, education qualification, online application procedure and salary of this post in this article. This is the first paragraph of gds bharti of madhyapradesh circle. in the notification all the details are being inculcated and confirmed by official india post department. Applications are invited by the respective appointing authorities as shown in the advertisement for each post. Eligible people can apply for gramin dak sevak vacancy under madhya pradesh circle as per below given procedure. The online application process was started in the January month at the 19th Date, And it will end in February month on 19th 2018. Total 2411 vacancies is being allotted to the candidates under the india post MP Circle. educational qualification in which he/she has studied computer as a subject. of other than GDS BPM should reside in post village/delivery jurisdiction. payment. Names of the offices are available in the website http://appost.in/gdsonline. The candidates who have already registered and paid the fee in response to the earlier Madhya Pradesh notification dated 03.04.2017 (which stands cancelled) need not register themselves against the new notification and do not need to pay the fee again. They are allowed to apply online afresh based on the old registration number and fee already paid in response to the earlier notification. 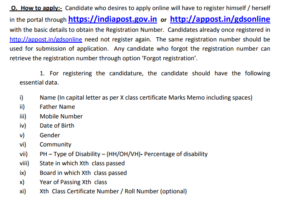 India post made the selection procedure of This GDS vacancy very simple. They prepares the merit list on the basis of 10th standard marks achieved by candidate and publishes in the appost official website. The MP GDS merit will be declare there after the recruitment procedure will end. First you need to visit the official website of the India Post. Next, you need to find out the recruitment section in the homepage. A new page will open where you will be required to fill in all the necessary details such as name, gender, father’s name, category, mobile number, qualification, etc. Make sure that the information you enter in the online application form is correct. Before, you submit the online application form you will have to attach the required documents along with your scanned signature and photograph. Once you are done with the above mentioned step, verify the online application form nicely. In order to complete the MP Madhya Pradesh GDS apply online process, click on the ‘submit’ button. This should successfully get you registered. Don’t forget to take a print out of your online application form for future use. So you will need some pre-collected data to fill up application form which is described in above given image. Also you need to complete the OTR first and then click on apply online button on appost.in. How To Check Your Madhya pradesh GDS Results? First visit the official India Post website. After the website opens, you need to search for the ‘MP Post Office Merit List 2017 – 18’. Click on the link and you will be redirected to a new page. Here you will be asked to enter the necessary details. Make sure that the information you enter are all correct. After you are done, hit the ‘enter’ button on your keyboard. The Madhyapradesh Post Office merit list 2017 – 18 will appear on your computer screen. Take a printout of the merit list. Interested candidates therefore, should hurry up and apply for the MP Postal GDS recruitment as long as the online registration is open. After all such great opportunities don’t knock at your door every day. 1.2.1 How To Check Your Madhya pradesh GDS Results? Sir plz reply kya uttar pradesh wale bhi apply kr sakte hai..? I’m from chhattisgarh. Can I apply for this post. agar aap interested ho to bharo ye mat dekho 68 me hoga ya nahi. sabko pata hai chance banta hai. I’m from chhattisgarh. Can I apply for mp circle using same registration number. Sir, talati mantri exam from ni data ??? Are sir mp gds ka result aye ga ki nahi plz. Replay kro mere 10th me 73.5% h me genral ka hu koi chance h kya replay plz.